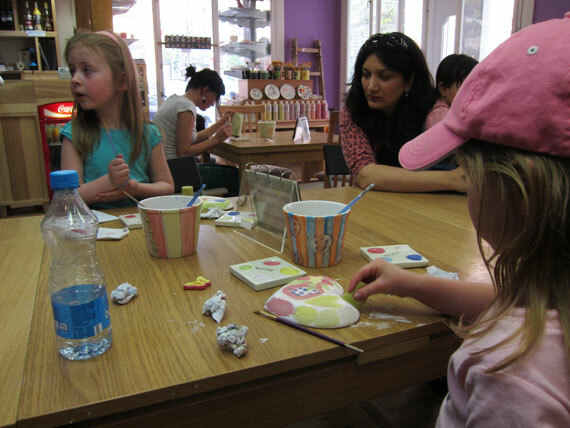 Kavarna Maluj is a paint your own pottery studio for painters of all ages. 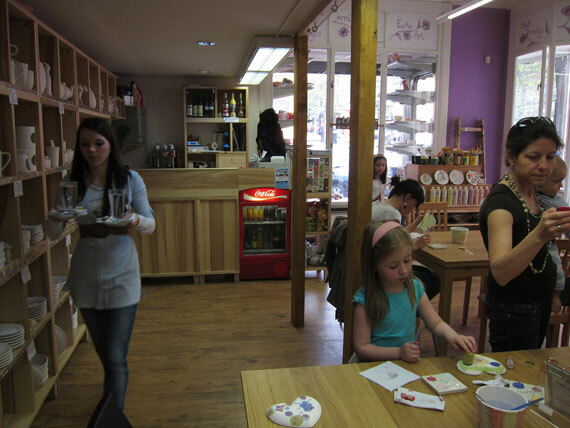 Both a pottery studio and a café located in a sunny shop in Vinohrady, it is a fun way to spend an afternoon with your kids or an evening out with other moms. Kids can create their own masterpiece by selecting a piece of ready-made pottery and then designing and painting it themselves. Whether you are looking for a unique birthday party idea, a special gift for a grandparent, or just want to have some fun, Kavarna Maluj will surely meet your expectations of a fun, creative activity. Note that all materials are lead-free and non-toxic so you can drink from your mug and eat from you plate! 1. Select the piece of pottery that you want to paint. Choices include plates and bowls of all sizes and shapes, mugs, piggy banks, boxes, small figures such as dragons and princesses, tiles and more. 3. 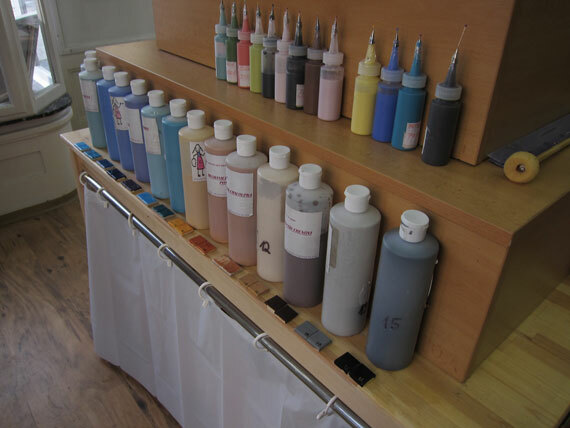 Pick up your paint brushes, stencils and sponges. 5. Leave it at Kavarna Maluj where they will apply a clear glaze and fire it in their kiln. Don’t worry, Moms, finished product is non-toxic! Regular hours are Tuesday through Sunday from 14:00-22:00 however, by request, the shop can open earlier for a minimum of four customers; requests and bookings can be made via phone or email. For example, when my daughter’s school was closed for holiday, I had organized a group of us to go at 10am. It was great to have the place to ourselves and I even was able to manage my toddler in the little kids corner. The venue can also be booked for birthday parties, quite a good idea for older kids or for during the winter months. Note that because Kavarna Maluj has become so popular, I recommend calling or emailing ahead to make a table reservation. 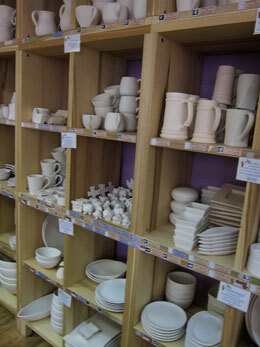 There is a wide range in prices which include both the pottery and the time spent painting. The ceramic pieces are imported from the US and the price does reflect the import cost. The least expensive items are from 200kc and the most expensive items are up to 990ck. The average price is around 400kc. I should also mention that they run quite a few courses for both adults and children on pottery design and decoration and also lessons using the pottery wheel - there are 2 wheels in their downstairs classroom. A minimum of 2 students are required so if you can convince a friend then this is another activity you may find interesting. Full details are on the website, but this is only in Czech (unless you use Google Translate). Many of the girls in the cafe speak English so instruction in English should be possible. 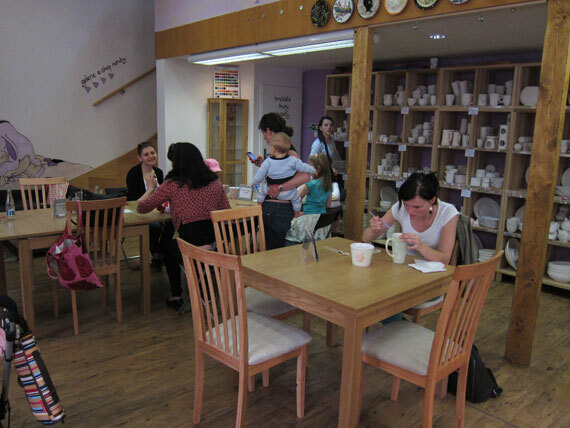 The cafe offers a small selection of snacks and drinks for both adults and children. You can even order wine by the glass which would compliment a child-free session with friends in the evening - just bring along a nice roundel of cheese and biscuits and you’re set! DIRECTIONS: By Metro: Take the green A line to Namesti Miru and walk 4 blocks up Korunni Street. By Tram: Take Tram numbers 10 or 16 to Šumavska or tram number 11 to Vinohradská tržnice‎. By Car: There is paid parking around the small shopping centre Vinohrady Pavilon.